On Monday April 22nd Julie Loufton Friedman Steele will opening the first experiential retail 3D printing store in the world....we'll we think the world but for sure the Midwest and definitely in Chicago. It is definitely the only retail location in the world with an EOS P110 nylon laser sintering. The goal of the store is to introduce the general public to the magic of 3D printing and the potential for distributed digital manufacturing. 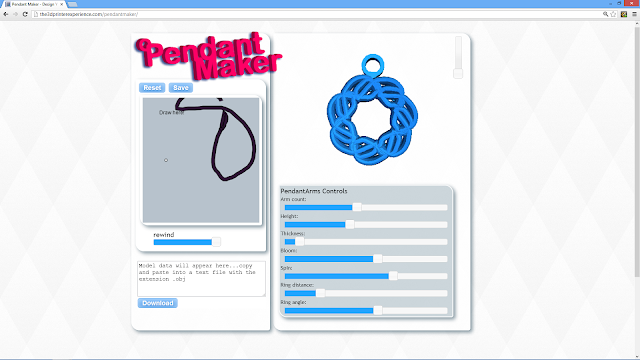 At the design bar you can sit down and design and print a pendant using their Pendant Maker App. The app allows anyone regardless of ability to doodle a line and the app takes the doodle as an input and makes it into a pretty cool looking pendant. You can then use the sliders to adjust the size and shape of the different design elements. When you're happy with your design you can print it out. Pendants take between 20-50 minutes to print out. 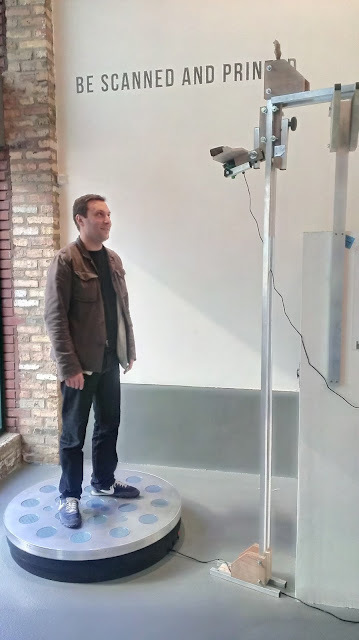 If pendants aren't your thing they also have a 3D scanning station where they can scan you and print you out! Inventables has teamed up with the 3D printer experience to provide 3D printers for sale and different colors of filament customers can buy to take home or print out their pendants in the store. The store also has a gallery of products that have been made using 3D printing technology. The product below is a violin being held by Mike Moceri of the 3D printer experience.